My friends are afraid this baby may be nekkid. LOL, just kidding. When I knew I couldn't keep up, I recruited reinforcements. My friend, Dawn, also a stitching buddy graciously agreed to smock a bishop for our baby. I had made a bishop as a gift from this butterfly print pique a while back. When our baby Mommy spotted what was left, she claimed it. And here are the beautiful results. Dawn is a superb stitcher. She can smock circles around most of us. These are her photos. 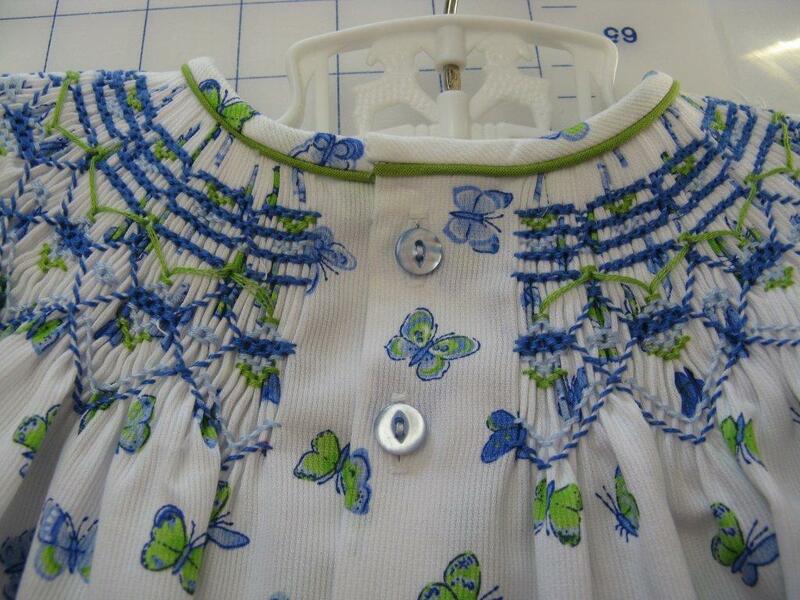 Close up of the gorgeous smocking. Also is the piping detail at the neck. The pattern is "Beginnings" from AS&E #73. 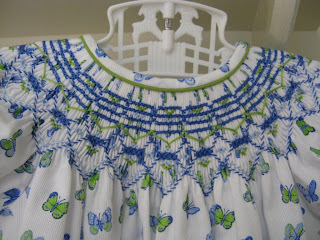 The smocking plate is "Jewel" by Wonderfully Made, available from your favorite heirloom retailer. I just love it, and better yet, so does her mother. 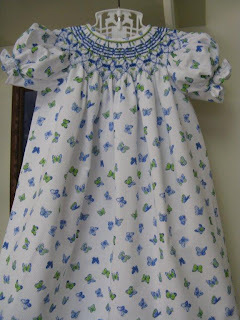 The back, where the smocking meets perfectly in the back. I never have that luck. Or should I say skill. Buttons are antique mother of pearl that were in my Jeannie basket. But this beautiful dress would not be complete without its model. She is 3 and half months old, weighs 16# and this is a size 6 months. Fits perfectly. Notice the cheek chewing. She is beginning to cut teeth. That has proved a little dicey the past few days. Not a happy camper. But pretty no matter what. This is absolutely beautiful. The fabric is delightful. The baby adorable. I have smocked some but my skills will never match those. They are impeccable. A garment to treasure. Eva is stunning in her butterfly bishop. Beautiful work! love that little dress. The little model is adorable!!!! You are more than welcome. It's great to see something I made on such a beautiful model. Thank you for giving me the pleasure. 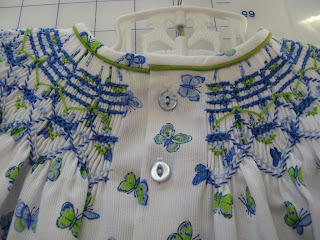 I love the smocking, the butterfly print, and the model! It's so nice you have friends concerned about her clothing. She looks beautiful in that gorgeous dress! 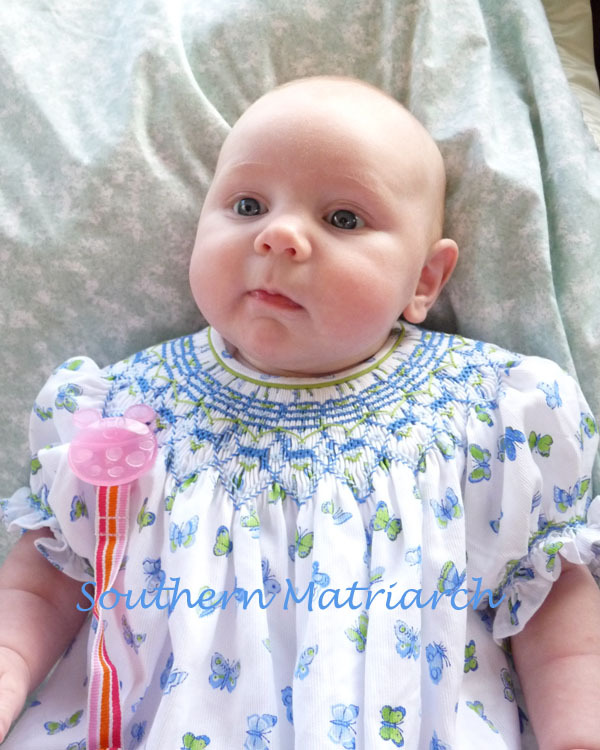 Love the fabric and the colors and the smocking is perfect!! I am delighted to know that the baby will not go naked... I was panicked about that the other night. Dawn does fabulous work and quick as a wink too. I hope EM's teeth cut through quickly so we can see her smiling! Oh, she is so cute!! I love watching her grow along with my little guy. He is 4 1/2 months and 14#, also teething. 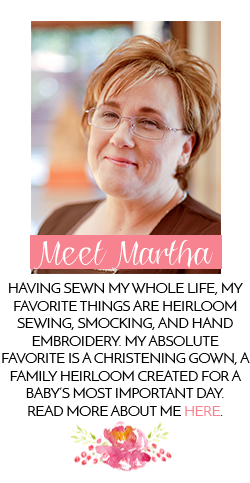 I love seeing all your beautiful garments, too. Precious Baby and dress. I think I know your stitching buddy, Dawn. Use to go to church with her at Judson! Gorgeous (the dress and the baby both!) 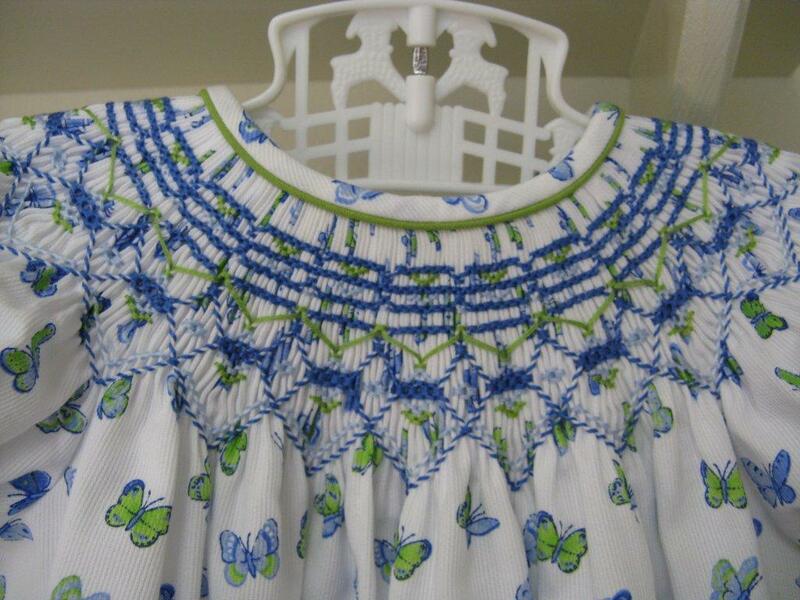 I love the colors, the butterflies, the smocking pattern.... And those cheeks!! 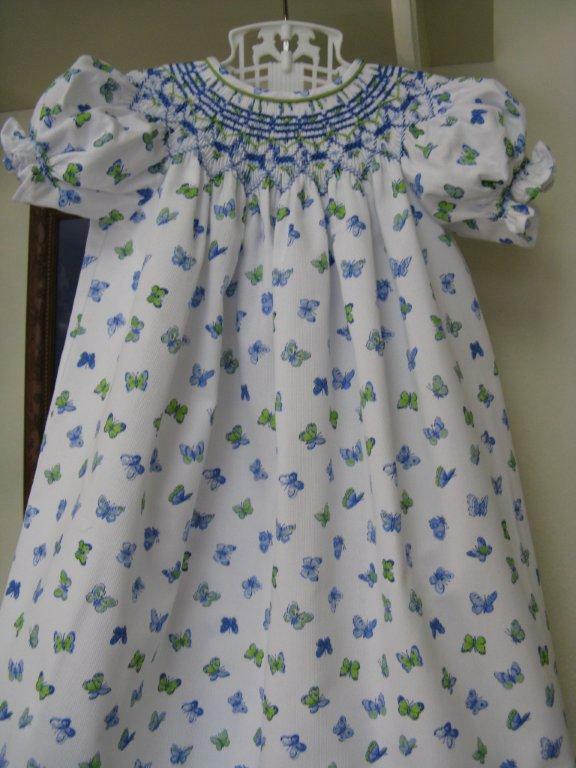 I love this dress, it just has "little girl dress" written all over it. And of course you have the perfect little model for it. She looks so sweet in the dress. I can't believe she is already cutting teeth.